With every sign that the agreement between the Democratic Unionist Party (DUP) and the Conservatives not being finalised anytime soon it is now perhaps the time to look at the chances of the Labour Party forming the next government should we have another election any time soon. Firstly I think it is worth repeating again just what a successful election Labour had by raising their share of the vote by almost 10% (30.4% – 40%) – a very significant achievement. However, as I have already written since the last election, just one week ago, they still lost the election as the Conservatives share of the vote also rose by 6% ( 36.9% – 42.3%) and as a result they were 59 MPs ahead of Labour. In short Labour’s number of MPs is back to the level that Gordon Brown managed to achieve in 2010. This is, however, history and what I want to consider today is the way forward for Labour to try and gain the required 326 MPs needed for a majority. This is when the achievements of last week start to pale compared to what is required and I think the reason for that can be summed up in one word Scotland. In the past any Labour government has been built upon the bedrock of a solid Scottish vote. This has now changed with the rise of the SNP. This is best illustrated by Table 1. 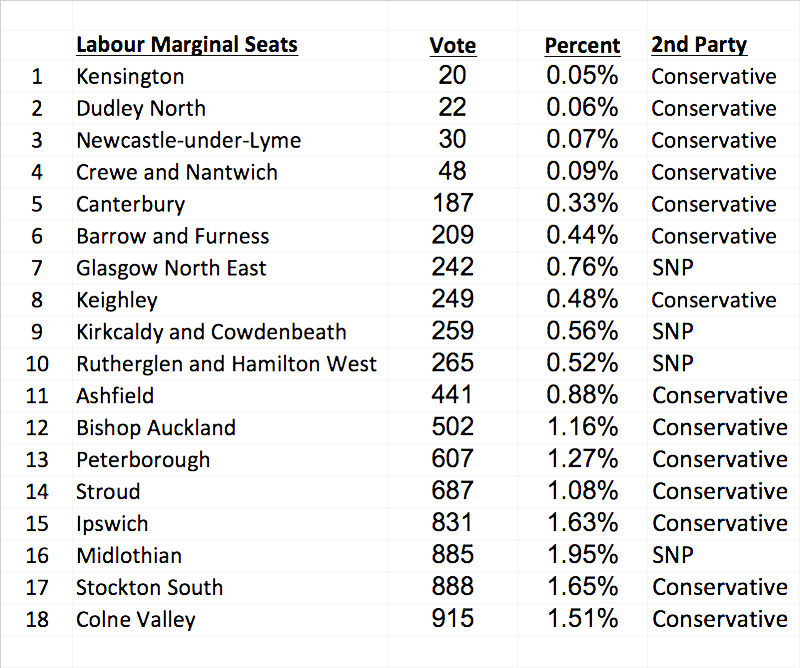 Here you can see the 18 Labour seats which have majorities of less than 1000 votes: 4 of the seats are Labour/SNP marginals and it would only take a swing of less 1% from Labour to the SNP to wipe these out. 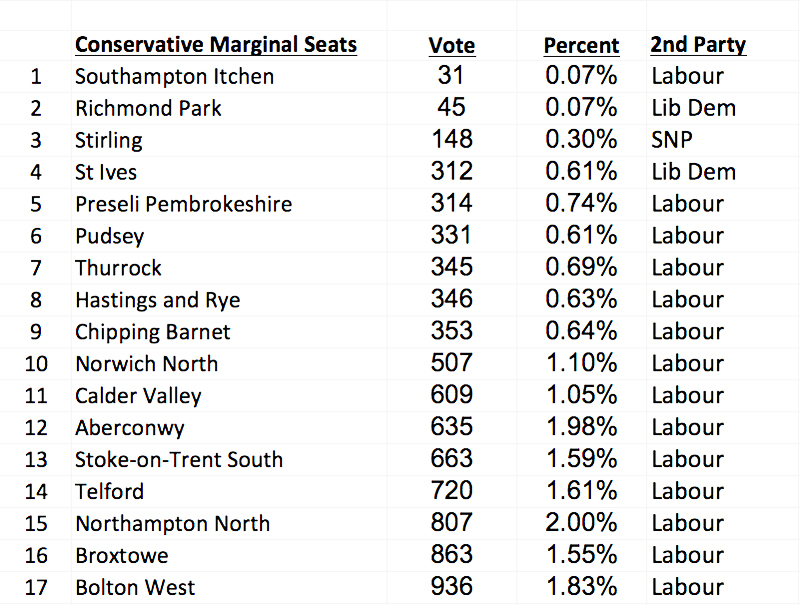 On the flip side of course 7 of the 9 SNP seats with a majority of less than a 1000 are Labour/SNP contests – Table 2. So a small swing from SNP to Labour would mean that 6 of these seats could become Labour seats. However, it does also mean that the SNP and Labour occupy the same political space in Scotland and there is no evidence of the SNP dissolving as a political force in Scotland so the chances of a revival of Labour in Scotland are at best 50/50. Without such a revival then the chances of a Labour majority become even less likely. One final thing to point out is that if there is a further fall in the SNP vote in Scotland then the Conservatives are likely to make gains as well along with the Liberal Democrats. When the Conservative seats with less than 1000 majority is examined the Labour problems become even more apparent: Firstly there is one less seat Conservative seat on this list than on the Labour list (17 to 18) which would suggest that the Conservative vote is more solid than Labour’s; Secondly, if there is a shift away from the Conservatives then 3 of the top 4 seats won’t go to Labour which again means they need to make these seats up somewhere else; (Again Scotland plays a role here because if the SNP are able to recover Stirling then perhaps they might be able to recover some of the Labour marginals in Scotland. Equally, I am not convinced that there is any real connection between swings against the Conservatives in England and Scotland – this can be described as the Ruth Davidson effect – in short I think the Conservatives seats in Scotland are safer than the Labour seats) and finally there are only two Welsh seats in the Conservative list. Labour did well in Wales in the 2017 election so if this is repeated then they may well get the two Welsh seats. (This is a dual edge sword because the Welsh Labour party is now much more independent of the national party again because of devolution. If this trend continues then Prime Minister Jeremy Corbyn may well face the same problem with Wales as Theresa May faces with Scottish Conservatives – they both will have separate agendas which won’t necessarily align with the national party.) So for Labour to do well they are going to have to beat the Conservatives in England and the last time they did this Tony Blair was the Labour Leader and his policies were significantly different to those of Jeremy Corbyn. This doesn’t mean that Labour can’t sweep away the Conservative government it just means that it will be a herculean task. However, there is one reason to think they may well do it – Brexit. If the current government make a complete balls up of the negotiations then this will totally discredit the Brexiteers and may well make one time Conservative voters think about moving to a left wing Labour party. But as the song says…Perhaps, Perhaps Perhaps? This entry was posted in Brexit, Conservative Party, Labour Party, Politics and tagged Conservative Party, DUP, General Election, Jeremy Corbyn, Labour Party, Liberal Democratic Party, Ruth Davidson, SNP, Theresa May. Bookmark the permalink. 3 Responses to So how hard will it be for Labour to form the next Government? On the other hand if the constituency boundaries are changed before the next General Election then Labour will have to get half the seats without their current built in advantage of the old boundaries. Just one more branching point to consider. This is probably correct, although whilst I have seen the assumption that this may well be the case until it has been tested in a real election it can only be a theoretical – after all the significant change in Scotland and the performance of the Labour Party suggests that such assumptions are not that correct. Anyway there is a long time to go before they are put into place and I suspect there will be another election before then – possibly as early as the autumn. So we’ll just have to weight and see.